I'm willing to bet that most readers of this blog probably don't see 3,000 camels on a regular basis (but I would not be surprised if a few of you do!). Like you, a large herd of camels is not part of my everyday life, so this verse stuck out to me. I know where the zoo is in my city where I can see a couple of camels, and I've even kissed a camel before at Jericho (a little trick that tourists do where you put a date between your lips and allow the camel to eat it from your mouth). Yet seeing a whole herd of these animals roaming free in a field would be remarkable. 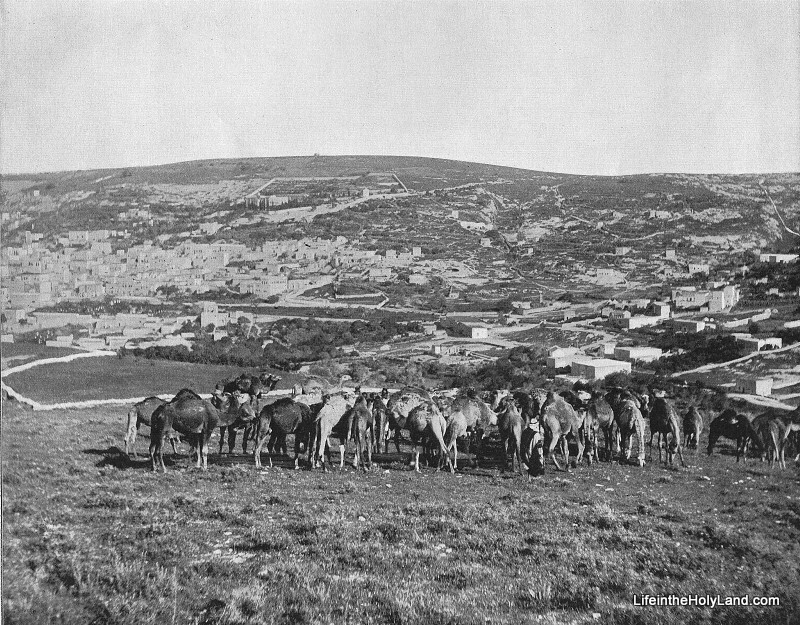 CAMELS FEEDING AT NAZARETH.- The Bedouins ... live by cattle breeding, and possess immense herds of sheep and camels, as we said under a former picture. The eastern branch of the plain of Esdraelon and the valley of Jezreel, are the home of the wandering Bedouins who often pitch their tents near there. The little town of Nazareth is often harrassed by the quarrels of the Arab chiefs and the predatory attacks of the Bedouins. 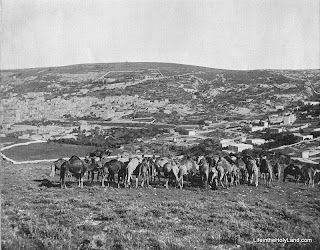 Their herds feed upon the grassy slopes, the camels seeking the sunshine, or loaded with tents and the multifarious furniture of the camp, go roaming abroad "for fresh fields and pastures green." To the stranger the slow-paced camel with his soft-cushioned feet, his noiseless solemn tread, imperturbable patience imprinted upon his dun colored face, seems a picturesque and amiable animal, but to one who knows him well he is cross, discontented and often treacherous. H. M. Field in his “Review of Recent Events in Egypt'' says: "As my camel and I were to be on somewhat intimate terms, I approached to make her acquaintance, and even tendered her some little caressing. I attempted to stroke her gently; she instantly swung around her long neck and gave me a vicious snap which warned me not to presume on any familiarity." The camel, with all its faults, is an interesting animal. The riding camel, which forms an indispensable feature in processions of special character, when smartly caparisoned with shawls and strings of coins, is exceedingly artistic. Fortunately for Job, at the end of his adventure, a herd of camel was restored to him (Job 42:12). Actually he received twice as many camels as he started with! But unfortunately for the rest of us, the importance of camels as a means of transportation in the Middle East has seriously diminished in the last 120 years. Air conditioned cars, trucks, and buses have taken the place of this "interesting animal" and thus the modern world looks vastly different from the world of Job. That is why collections such as Earthly Footsteps of the Man of Galilee are such valuable tools for the modern teacher and preacher. Photos such as this help us to turn back the clock and place our listeners in the world of the Bible. This photo and almost 400 others are available in Earthly Footsteps of the Man of Galilee which is available here for $20 (with free shipping). Additional images of and information about camels are available on the BiblePlaces website here and here, and on the LifeintheHolyLand website here and here. Almost 20 photos of camels are included in Volume 17 of the PLBL which is available for purchase here. To see a traffic sign warning drivers of passing camels, see the post I wrote a few months ago here.